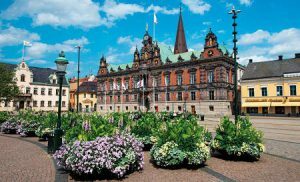 Northern countries might not be top of everyone’s list for a summer holiday, but the entire region is a surprisingly popular tourist destination all year round. Dramatic fjords, scenic islands, volcanoes, lush forests,lakes and waterfalls attract people from all corners of the world. There’s also the draw of rugged adventures in Arctic wilderness to royal palaces and the chance of a glimpse of the Northern Lights. The largest city and capital of Estonia, Tallinn combines modern comforts with a versatile nightlife and deep history. Must-see places include the city’s walled, cobblestoned Old Town, home to many shops and cafés; the Estonian History Museum, edicated to the country’s 20th-century history; the Gothic, towering Town Hall, which is the Baltic region’s oldest, and the Alexander Nevsky Cathedral. Built in a typical Russian Revival style between 1894 and 1900, the church has been beautifully restored and the rich decoration and 11 bells (one weighing 16 tonnes) make for spectacular photographs. Couple these with a vibrant nightlife, culinary treats and pleasant weather and you’re in for a great time. The lesser-known village of Flåm is, surprisingly, a very popular tourist destination and has been since the 19th century. 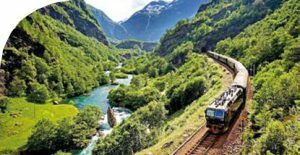 One main draw to the location is the 12-mile long railway line between Flåm and Myrdal, which is one of the steepest railway tracks in the world. Almost 80 per cent of the journey, which runs through steep mountains, breathtaking waterfalls and 20 tunnels before stopping at Myrdal mountain station 867 meters above the ocean, has a gradient of 5.5 per cent. You can also combine your train journey by exploring the Flåm Valley on foot. This idyllic walk trails down the last section of the popular Rallar Road, ending back in Flåm. 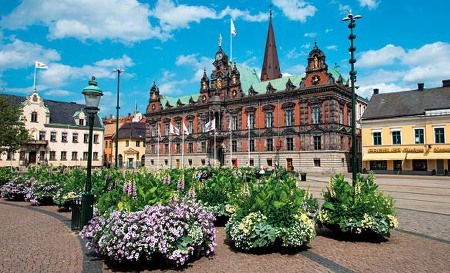 Gothenburg is situated on Sweden’s west coast and is known for its Dutch-style canals and leafy boulevards. Avenyn, the city’s main thoroughfare, is lined with many shops and cafés, ideal for whiling away an afternoon. However, if you’re more of a thrill-seeker, then Gothenburg’s theme park awaits you. Liseber amusement park offers something for everyone, from the Balder – one of the biggest and most thrilling wooden rollercoasters in the world – to the Children’s Paradise, a huge kids’ playground. The AeroSpin – a plane adventure that is 35 metres above the park – is not for the faint-hearted, but does offer a spectacular view! For a more cultural afternoon, the Gothenburg Museum of Art is worth a visit. The museum has three stars in Michelin’s Green Guide and houses Nordic collections dating from the 15th century. Round off your trip with a waterside city tour in a Paddan canal boat, which will take you around the moat and canals of the city. Bliss!